Lately I've been busy making little changes all over the house. I just finished a fun little project for my laundry room, and I'm eager to share it with you! My poor laundry room had reached the point of chaos, so I've been working on a budget-friendly redo. The room is small, and this back corner of my laundry room is just big enough to hold laundry baskets and a small shelf for folding clothes. But I want it to be a cheerful space. Inspired by images from the mid-20th century, I decided to go for kind of a retro feel in this little room. I found the red clock on clearance at Target; it was just what I wanted. To go with the clock, I used a vintage tablecloth that had gotten a bit too ragged to use as a tablecloth to create some decor. 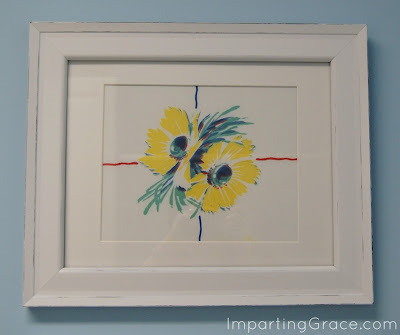 For this wall art, I simply spray-painted and distressed a couple of pre-packaged frames from the shelf at Costco, where the twin pack cost around $15. They were originally black, but that look felt a bit too heavy for this room. Distressed white is just right. Then I cut and starched a couple of pieces from the tablecloth, taped them to back of the mats, and popped them into the frames. If you look closely, you can see a small stain that couldn't be removed from this panel. 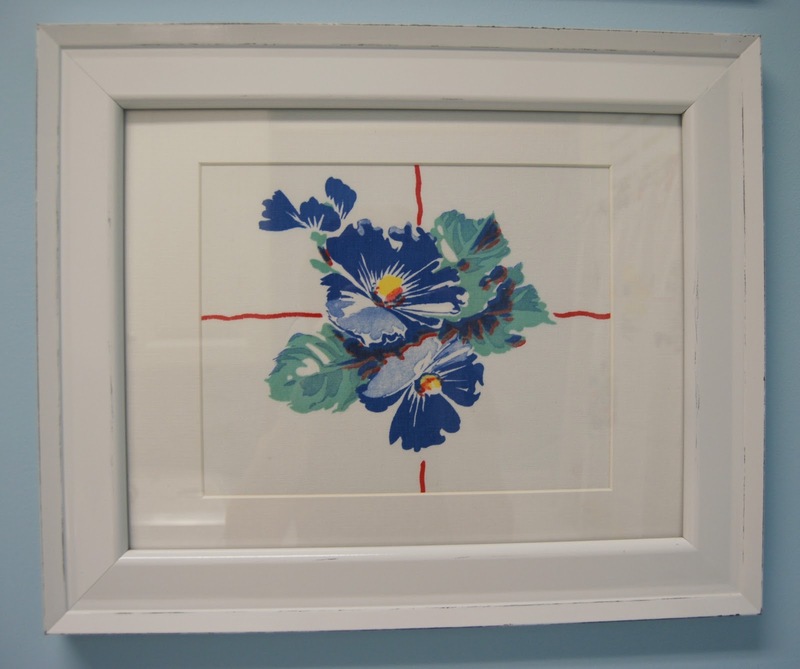 But I don't think anyone is going to be looking that closely at the art in my laundry room! Aren't they cheerful and pretty? And the best part is that they cost me nothing other than the cost of two inexpensive frames, a bit of spray paint, and a little time. Now to finish the rest of the laundry room so I can show it to you. Ahem. Since this will include finding the mates to about 50 odd socks, this may take awhile. For now, I'm so happy with custom art pieces! What do you think? 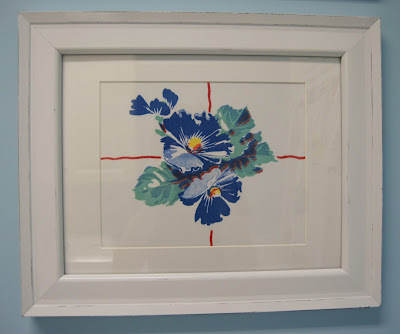 and the Framed Fabric Ditto DIY Challenge at Fieldstone Hill Design. Richella, what a lovely and fresh decorating idea. I happen to recognize the table cloth from one my own mother had. I even have a very similar dish towel. Such a great way to recycle with purpose. ooh, I love it! 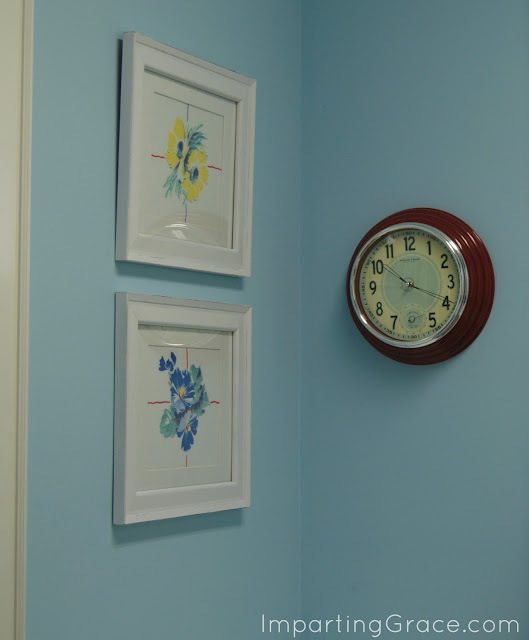 Your red clock is perfect for bringing out that red line in the table cloth art! A great idea for saving those vintage cloths!!! 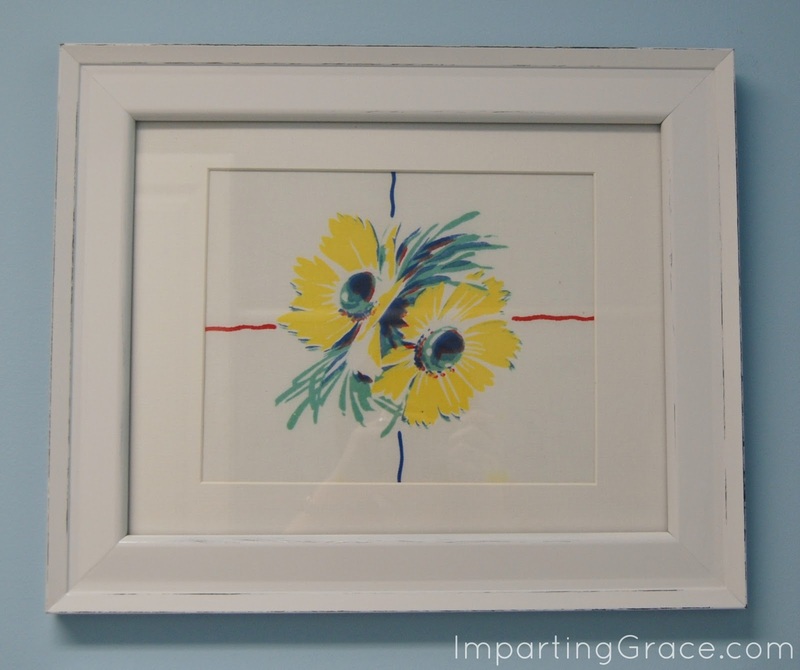 Over the years I have thought about framing fabric, but I have never done it. Maybe one of these days I will just do it! I love these! Vintage linens are a weakness of mine. What a great way to display them! Your pictures are so pretty, and I love your blue walls. 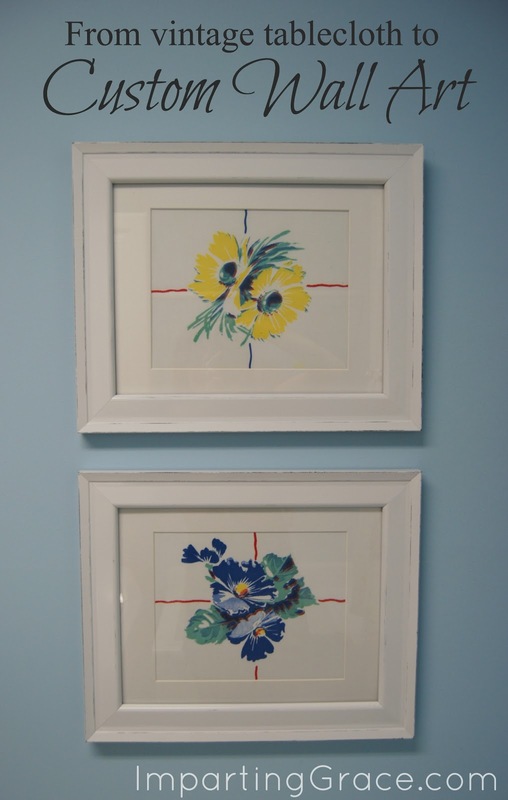 What a nice way to brighten up your laundry room! I need to do the same, and you've inspired me. Now I just have to find time! What a fun idea. I love it! I love vintage tablecloths! Ohh great idea! Thanks for posting! This is such a cute idea, Richella! I truly think I'm missing out -- no vintage tablecloths or sheets in my home! Yikes, the search is on! I want to make some of these cute things I keep seeing. It is great when we find art in unexpected places, right?!! What a sweet use for a vintage tablecloth! They are so pretty in that room. Thanks so much for linking up to Ditto DIY!